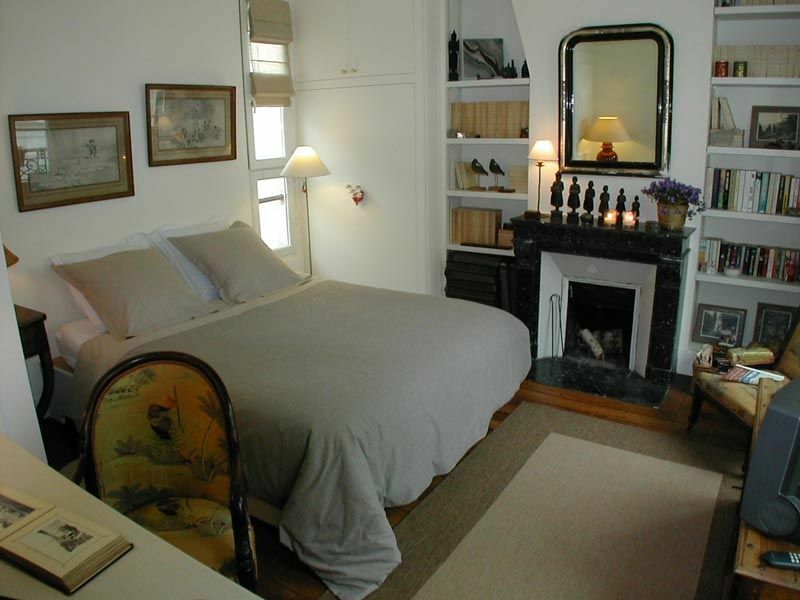 This charming Parisien flat is situated in the heart of Paris. Two Minutes walk away from the Jardin des Plantes, Notre Dame, the Institute du Monde Arabe, and the Quais de Seines and their famous Bouquinistes. Within walking distance from the wonderful open market on the Rue Mouffetard. This calm and sunny flat is situated on the third floor WITHOUT A LIFT. This is a very animated quartier during the day, and quiet in the evening, but 5 minutes away from the flat are fabulous little French Bistros and cafés, that remain full of life until late at night. The area is very safe, and it there is no problem to walk at night, the metro station Jussieu is 3 minutes walk away down the street. There are also regular buses and now the new French Velib bicycles, if the weather is nice this is a really great way to visit Paris. The flat consists of a large bedroom, with one queen bed that can be made up into two single beds if necessary, it is filled with beautiful pictures and books, and most importantly a collection of very rare and original photo albums and diaries, making fascinating reading about the owners grandfathers travels round the world in 1895. The second room has a small kitchenette with sink and microwave, and a table and armchairs. Leading off to a small bathroom with shower, sink and lavatory. This flat is very light and sunny, as it is full of windows that give a cross light onto the courtyard on one side and a calm street on the other. You will find in the fridge on arrival, everything you need for French breakfast during your stay. You may arrive at any time you want, the owner will welcome you, and ensure that your stay be a memoriable one. After my years at college in England and my years in Bermuda,I went around the world and afterward I settle in Paris in 1968, Working as a Public Relations, in different field. I worked at TWA , travel agencies, advertising , movies, The Coca Cola Company, and now I am taking care of my guests...and just love it ! Upon your arrival, you will find in the fridge everything you may need to make your French breakfast with Baguette & croissants ! We loved our stay here! We walked everywhere - through the beautiful Jardin des Plantes and along the Seine to all the best Paris has to offer. The flat is spotless and has a new bathroom with lots of hot water and heated towel racks; the bedroom has a pretty fireplace and bookshelves with books from the owner's travels, the bed is very comfortable. One side looks over a very quiet courtyard and pretty roofs, the other over a small side street which turned out to be very quiet. The host, Catherine, is delightful and very prompt in arranging arrival, departure, and any needs you have while you're there. This place is just right. Thank you, Catherine! What a charming apartment! I loved it and Catherine is the perfect host! I hope I will have the opportunity to stay here again when I return to Paris. It’s a wonderful apartment, in a great location, with a delightful host. Catherine is so welcoming. She lives in the apartment above, so is very flexible with the check in time. The nice bottle of wine and breakfast treats upon arrival are a nice touch too. You immediately feel at home. Catherine took such great care of us, like were family. With lovely wine upon our arrival, to beautiful “confiture” in the fridge, we felt immediately at home. The Latin Quarter is awesome! The apartment is fantastic, we had a wonderful stay and Catherine is a wonderful host. Simply perfect! A hidden gem in the 5th! I have stayed at Catherine’s 5 times this year. I travel frequently to Patis for work. Catherine’s suite is the perfect Paris getaway and home. Situated in the 5th arrondissement between le Jardin des Plantes and several outstanding matches (Place Monge and Place Maubert Mutualité), bus and métro lines, the location is perfect. The suite is as pictured - tastefully decorated, with lovely linens and dishes and a very comfortable bed. Catherine is welcoming, helpful and a pleasure to know! Whether on business or for pleasure -- If you're looking for a memorable and relaxing Parisian experience, in a central and safe location, within easy walking distance to dining, shopping, museums, gardens, historic landmarks, or any other place you'd like to go -- yet quiet and peaceful at night -- with an excellent host -- this is the place. The apartment is beautiful, spacious, and very clean, with all the comforts you might need -- including stocked coffee, tea, fresh cream, juice, etc. -- beautiful dishware, fresh linens (with extra towels!) and french windows on both sides (allowing wonderful breezes throughout the apartment whenever desired!) -- with the extra special touch of an awesome bottle of wine gifted to you upon arrival. One thing we really loved was the fact that we could arrive anytime we needed, and store our luggage until the apartment was readied from it's last occupant -- such a great feature for weary travelers! The truth is, Catherine (your host), works very hard to have the housekeeper arrive very promptly, so that the apartment is ready for your earliest need. Catherine is the most charming individual you can imagine -- welcoming, well traveled, sophisticated, informative and readily available, yet completely unobtrusive. Her friendly, helpful style will simply make your visit enjoyable! We absolutely loved our stay here! Thank you Catherine -- we hope to see you again soon!! see you soon again ! !